a Way West for everyone. In his present form though, youd’ve expected it. We tend to forget that we’re in the luxury goods business, and that like art and antiques, when times are tough, if racehorses are your vocation, you need to have all your wits, and you have to have a product that stands alone. Deep inside, we’ve been of the belief that this sale could retreat by as much as 10-15%, given that world markets in racehorses have retreated by as much as 50%, and the substantial gains in the opposite direction this sale has witnessed. That this wasn’t the case at the TBA sales complex yesterday evening, says something for the “package” attached to the Ready To Run. The bare facts were a drop in average from R177,613 last year, to R172,769 in 2010, (roughly 3%), and a clearance rate of 82%, against 94% for 2009, and I guess we’d have to count that as a good result, though there will obviously have been disappointment for those who didn’t sell their horses. We have conducted a bit of trade since the close of business late last night, with a further six horses changing hands, and we expect this trade will continue for the next couple of days. Another feature of the sale which contrasted starkly with the past few years, was the absence of buyers in the R40,000 to R100,000 bracket for the last 40 or 50 lots, surely the best indicator that the “Golden Village” had run out of money to a degree. We’ve seen trade escalate for these same lots in the past couple of years or so, principally because we’ve made a policy of restricting the numbers in the catalogued to 165, yet this was a few too many this year. By any stretch though, we’d have to be gratified by the trade we did, particularly when you recall that this sale has bucked the international trend several years in a row, posting gains of 45%, 52% (in the wake of the collapse of Lehmann Bros in 2008) and 12% last year. It remains one of the best performing sales in the world, to put it into its correct context. The highlights of the sale included five millionaires, bought respectively by a Sheikh from Dubai, a miner from the Democratic Republic of Congo, a businessman from Hong Kong, and South Africa’s equivalent of the Maktoum family and Coolmore (combined, if you like! ), Markus Jooste and his great pal and colleague, Chris van Niekerk, represented respectively by Mike de Kock, Dennis Drier and Sean Tarry. 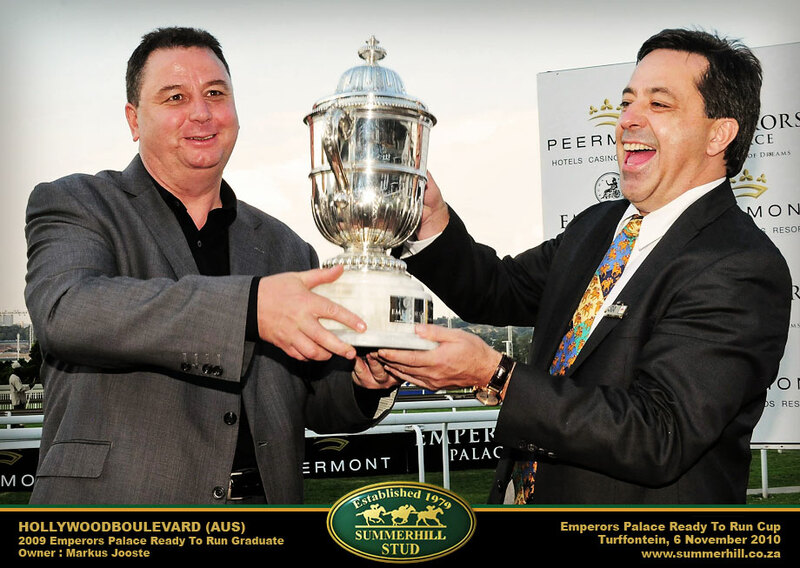 Overall, Markus Jooste, Form Bloodstock and Mike de Kock were the sale’s major supporters, but never lets forget the broad spread of buyers who come back to this ring year in and year out, to stake their claim for what will be a R2million Emperors Palace Ready To Run Cup prize next year. And speaking of the prize, Saturday’s big race was a triumph this year for the more expensive horses, with Hollywoodboulevard trumping the hitherto unbeaten Igugu for the lion’s or more appropriately, the lioness’ share of the booty. Hopefully, as this was the second conquest by the fillies over their male counterparts in four renewals of the Cup, the argument that colts and fillies should be separated in two different races will be put to bed forever. A final standout feature was the very solid and well deserved demand for the progeny of our young stallion, Way West. Buyers obviously like him, and those that had them were pretty much rewarded for their patronage of this horse in his second season. The 2010 Emperors Palace Ready To Run Sale ended on a slight decline from last year. The aggregate of R21,060,000 fell from last year’s total of R25,030,000. The first session of the Sale began with a bang, when a handsome Dansili colt (lot 22) sold for R1million. Consigned by Klawervlei, the colt, named Dansili Express, is out of a winning Sadler’s Wells mare, and hails from a powerful international family. Dansili Express was purchased by Form Bloodstock. International pedigrees were in high demand, with a beautiful Rock of Gibraltar filly (Lot 13 Mantatise (Aus)), consigned by Summerhill Sales, sold for R700,000. Not only was the filly sired by a top international sire, but she is out of a half-sister to US Gr1 winner Storm Trooper. The filly was another snapped up by Form Bloodstock. Lot 18, a colt named The Real Nick, is a strapping son of Kentucky Derby winner Fusaichi Pegasus. He fetched a handsome R500,000, and was another consigned by Klawervlei. 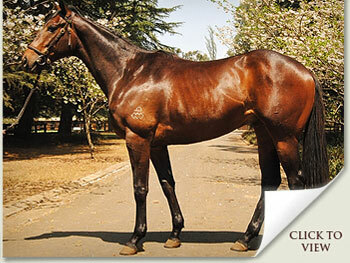 The Real Nick is from the family of champion sires Flying Spur and Encosta de Lago. 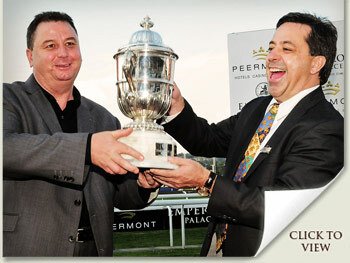 The colt was bought by Cape trainer Glen Kotzen. Klawervlei also did well with lot 16. A superb individual, the chestnut colt is by Klawervlei’s resident sire National Emblem, and is a half-brother to smart Cape sprinter Wethreekings. He fetched R400,000. Good Hope Racing picked up the handsome colt. Another locally bred 2 year old to sell well was lot 34. 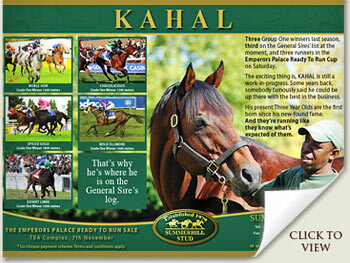 The chestnut colt, named Halabaloo, is by Summerhill’s star sire Kahal out of the top-class juvenile filly Bridal Paths. The chestnut was another purchased by Form Bloodstock. 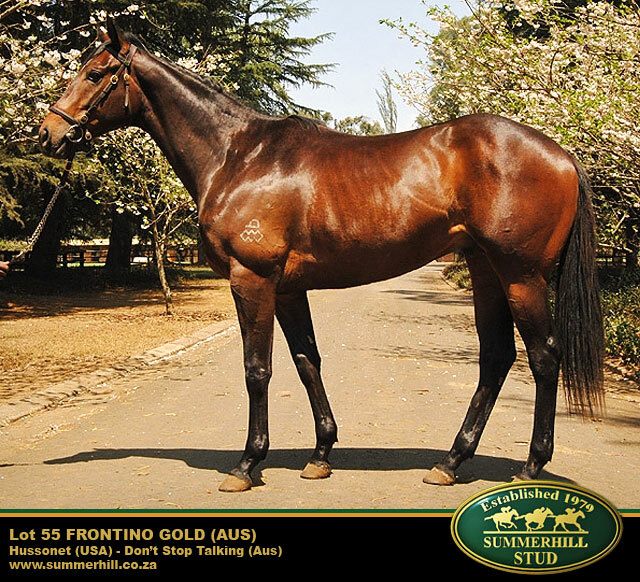 The sales topper was Lot 55 (Frontino Gold (Aus)), a Hussonet colt which sold for R1.3 million. He was purchased by Form Bloodstock. Lot 61 (Unnamed), an Elusive Quality colt was purchased for the second highest price of the sale, R1.2 million, by Mr. K M Lam, a Hong Kong-based businessman. The TBA’s CEO, Jan Naude, had this to say of the sale, “It seems as if the bottom end of the market is still suffering from the results of the recession but a nice specimen with a good pedigree was still in demand. The increase in horses which failed to make their reserves resulted in a drop in the sales aggregate. It was noticeable that there were new faces around the sales ring, as well as buyers from Hong Kong”. 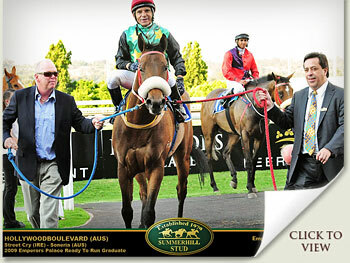 Hollywoodboulevard is a graduate from the Summerhill draft of the 2009 Emperors Palace Ready To Run Sale. Summerhill Stud in Mooi River has won six consecutive South African champion breeders’ titles - but this remarkable achievement hasn’t made the Summerhill enterprise at all complacent. That much is made quite clear by farm boss Mick Goss. Three Group One winners last season, third on the General Sires’ list at the moment, and three runners in the Emperors Palace Ready To Run Cup on Saturday. The exciting thing is, KAHAL is still a work-in-progress. Some years back, somebody famously said he could be up there with the best in the business. His present Three Year Olds are the first born since his new-found fame. And they’re running like they know what’s expected of them. That’s why he’s where he is on the General Sire’s log. COME VISIT US AT BLOCK A! 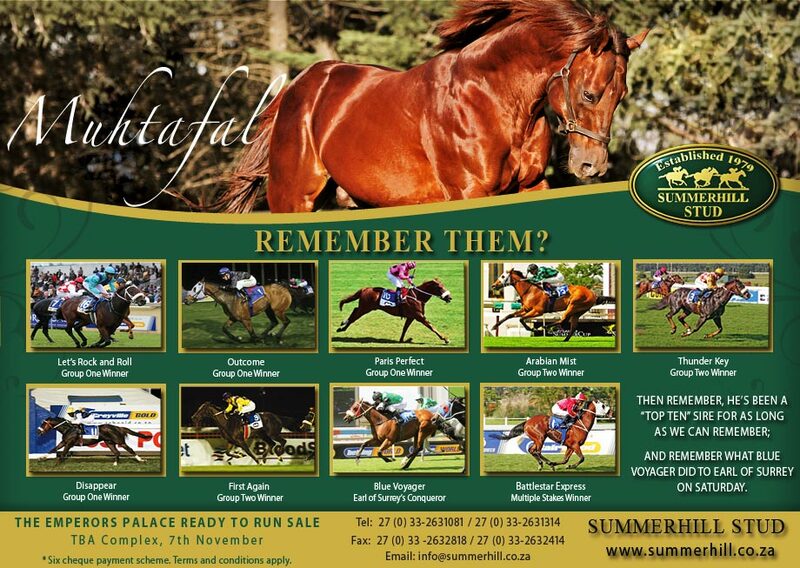 Our 2010 Ready To Run draft have settled in at the sales ground in Johannesburg. They travelled well from Mooi River and are relishing their daily routine of walking in the morning, being shown during the day and then walking again in the afternoon. It’s very hot in Joburg and if you’re coming to visit us to view our horses, you can be assured of a cool drink, good company and quality bloodstock! WAY WEST : IS THIS THE SIGN OF SOMETHING "BIG"
was a neck away from a National title in the Allan Robertson Fillies Championship Gr 1. The “smart money” will tell you they expected it of WAY WEST. An explosive juvenile, a prince’s pedigree and a flawless physique. So to be fair, a Highveld Juvenile Champion in his first crop was no more than WAY WEST stepping up to the plate. But given the opposition, you’d have to say that leading the second crop Sires, is a matter of exceeding expectations. Or is this the sign of something “big” in the making? Cataloochee was always out there on his own. An outstanding Two Year Old, a Champion Sprinter, and the nation’s leading freshman sire with his first runners. A Group winning juvenile, another Group placed, and now, three qualifiers for the R1,5million Emperors Palace Ready To Run Cup. 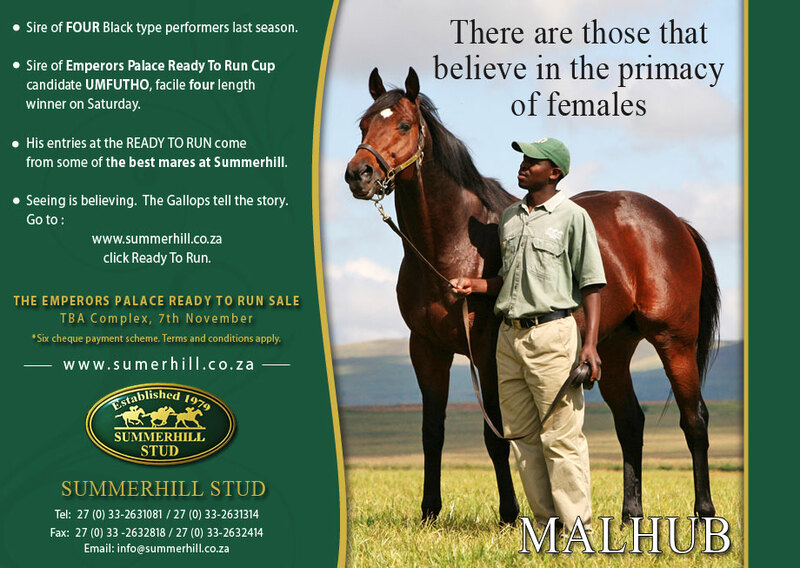 Go to www.summerhill.co.za and click Ready to Run. Lots 5, 9, 23, 31, 44, 62, 81, 90, 93, 105, 108, 112, 118, 121, 149 and 151. No sale has the same capacity to surprise. 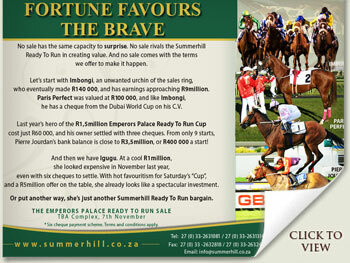 No sale rivals the Summerhill Ready To Run in creating value. And no sale comes with the terms we offer to make it happen. Let’s start with Imbongi, an unwanted urchin of the sales ring, who eventually made R140,000, and has earnings approaching R9million.Paris Perfect was valued at R100,000, and like Imbongi, he has a cheque from the Dubai World Cup on his C.V.
Last year’s hero of the R1,5million Emperors Palace Ready To Run Cup cost just R60,000, and his owner settled with three cheques. From only 9 starts, Pierre Jourdan’s bank balance is close to R3,5million, or R400,000 a start! And then we have Igugu. At a cool R1million, she looked expensive in November last year, even with six cheques to settle. With hot favouritism for Saturday’s “Cup”, and a R5million offer on the table, she already looks like a spectacular investment. Or put another way, she’s just another Summerhill Ready To Run bargain.